This year’s Greenville Public Library's Adult Winter Reading Program “Chill Out and Read” runs from January 19th to February 23rd and again offers an enjoyable way to spend the long, cold months. Don’t be caught home in a blizzard without your favorite authors! The program is also a fun way to win great prizes. Winter Read is for ages 18 and over and participation is easy. Check out any book, audio-book, e-book, or magazine and receive one entry form for each item checked out. All forms are entered into the weekly drawing then again in the grand prize drawing at the end. 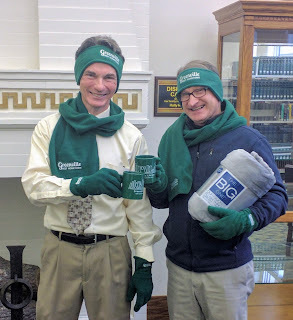 Weekly prizes this year are the gloves, hats, scarves, mugs, and blankets that were available for purchase from Mainstreet Greenville prior to the Hometown Holiday Horse Parade. Each item has “Greenville, Best Hometown” embroidered on. Director John Vehre and Librarian Sam Graves agreed to be our models. The grand prize is a beautiful gift basket with a $170 value donated by The Cozy Nest, a home decor and gift shop located at 418 South Broadway. In addition the kick-off event will be a “Warm & Cozy Open House” on Friday January 19th. A free lunch will be served in the Reference Room from noon to 1:00 p.m. (until supply runs out). You can receive five free entries just for stopping in! See you there!